The inscription above Berkshire Museum director Stuart Chase says it all. Giuliano photos. Chase with a selection from the 30,000 objects owned by the museum. In a playful mood Chase demonstrates how visitors interact with the exhibition. Kids playing under a relief sculpture in the exhibition. A view of the installation. Suits of armor fuel the imagination. A Persian helmet emulates the defenses of nature. A fanciful sculpture above the hearth in the ornate Crane Hall. 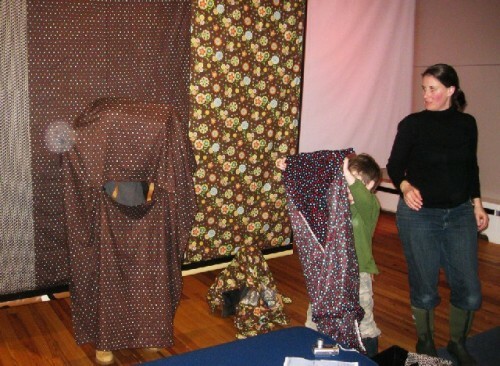 A Mom looks on as the kids try on camouflage outfits. 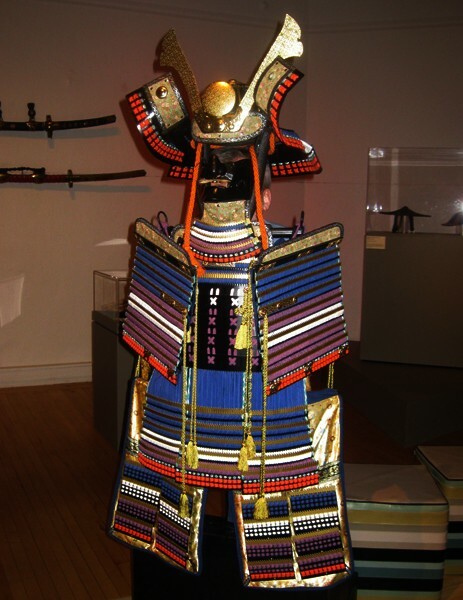 You can climb steps to look through the mask of this samurai outfit. These enormous samurai swords were use for ceremonies. 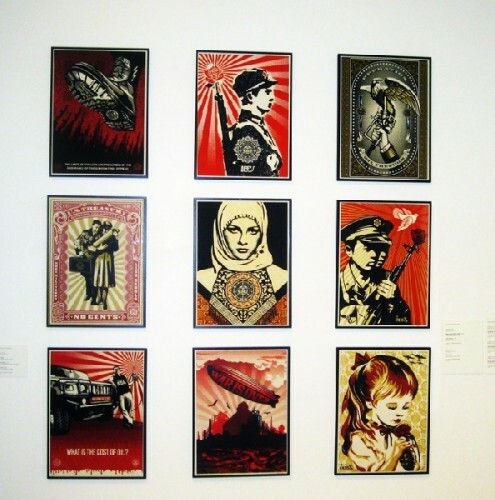 A grid of ersatz propaganda posters by the controversial artist Shepard Fairey. The dense, diverse, and insightful exhibition Armed and Dangerous: Art of the Arsenal offers a take on deadly weapons which are also exquisite artifacts. That bludgeon or sword designed to bash or sever a head is also quite beautiful. Visitors may enjoy this interactive experience at the Berkshire Museum in Pittsfield through June 6. Most of the diverse weapons, and works of art that illustrate them, come from the collections of the region's oldest and most eclectic museum. 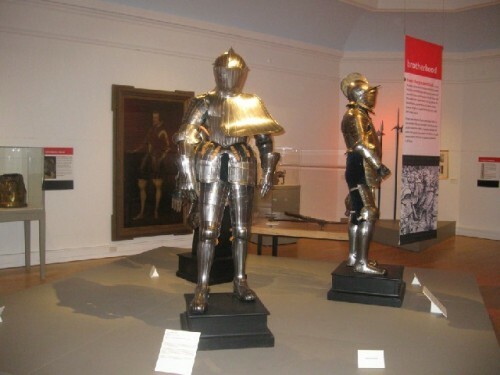 There are also loans from the Higgins Armory in Worcester, which specializes in weaponry, and from the ethnographic collections of the Peabody Museum of Harvard University. The Berkshire Museum, which was founded in 1903, has collected anything and everything all under one roof. It is a signifier of another era when museums evolved from Cabinets of Wonders. During the Age of Exploration wealthy individuals collected curiosities. These entailed what were then exotic items such as coconut shells or ostrich eggs. As museums evolved they have become ever more specialized. Consider the several museums in the Berkshires. The Norman Rockwell Museum in Stockbridge concentrates on aspects of illustration. Mass MoCA in North Adams presents world class contemporary art. Reflecting the collection of its founders Sterling and Francine Clark the Institute in Williamstown primarily focuses on 19th century French painting, American art, and Old Masters. It is regarded as one of the finest small museums in America. The Williams College Museum of Art has a diverse and intense collection, a hands on resource, for a great range of academic studies. Added to the mix is the Hancock Shaker Village. It is significant that these museums serve different mandates. They complement rather than compete with each other. All of the Berkshire arts organizations, some of the most renowned and unique in the world, meet on a regular basis. They explore means of working together and creating synergy. One of the primary issues is how to extend the season beyond just July and August. Three of the major programs- Tanglewood, Jacob's Pillow, and Williamstown Theatre Festival- are confined to that narrow summer window. Hancock Shaker Village has opted to shut down as a cost saving measure during the dead of winter. Everyone would like to see an expansion of programming during the shoulder seasons in the fall and spring. Given the academic calendar the Clark and Williams College are active during the winter as is Massachusetts College of Liberal Arts in North Adams . As Stuart Chase, the director of the Berkshire Museum, explained during a tour of the exhibition, most of its visitation occurs during the winter months. A portion of that comes from the 13,000 school children from the region who participate in a superb educational program. Because of the diversity of the collections, which include the natural sciences and a small aquarium, the mandate is to design programs that serve the needs of ever more specific curriculums. We met during school vacation week and the gallery was busy. Mostly there were parents with children. A group of kids were engaged in a special film making project. We chatted with a mother who had driven from Connecticut. In addition to her own kids there were children staying with them from the Bronx. She loves visiting the museum because "it is never crowded" and she feels safe bringing her kids. "They can wander around I don't have to keep an eye on them every minute." As with most Berkshire Museum exhibitions there are interactive elements. There are helmets to try on as Chase demonstrated playfully. And robes that kids use to camouflage themselves. By climbing up a few steps you can see through the mask of a samurai outfit. What fun. The museum is unique in encouraging hands on experiences. Children have a better understanding of objects and concepts when they have a chance to try them out. So there is a wonderful sense of play. The museum becomes an inviting place. 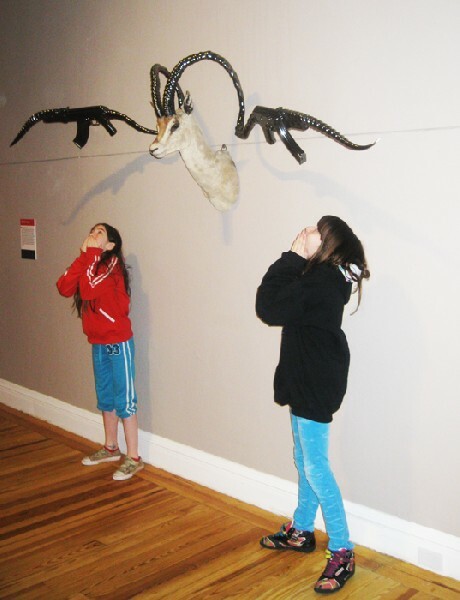 We asked the Mom, who studied archaeology, if her kids were relating to the exhibition? Definitely. Her son is obsessed with action heroes. He is in a phase of building and decorating weapons and warriors. I recalled my period of assembling model airplanes. Or playing Cowboys and Indians with other kids. During my first family visit to the Museum of Fine Arts I came home intrigued by samurai swords and mummies. It changed my life. Upon graduation from college I spent the next two and half years in the basement of the museum's Egyptian Department. This summer Chase is organizing an exhibition on the theme of mummies. That is bound to be a hit. In the five years that he has been the director of the Berkshire Museum Chase has yet to see all of the 30,000 objects in the collections. "I am very object oriented and love to spend time thinking of ways we can integrate the material into our exhibitions and programming. We are always being requested for loans. Our very important Norman Rockwell painting, considered to be one of his best, is included in the current exhibition at the Rockwell Museum." In the quid pro quo of organizing exhibitions having deep and diverse resources is a plus. Under the watch of Chase the museum has been upgraded and now has climate control. This is essential in securing loans for special exhibitions. The conservation of such an vast collection is an enormous concern and responsibility. Over time, if not properly cared for, objects just disintegrate. State of the art storage and conservation is expensive. While exploring the collection, a couple of years ago, Chase encountered what proved to be two rare and valuable Russian Paintings. They didn't fit the mandate of the museum's program and had not been displayed for decades. They earned a windfall when sold at auction. The museum now has resources targeted for acquisition and conservation. In the current exhibition he pointed out a highly detailed, academic, Orientalist painting that has recently been cleaned. It had been buried beneath dingy layers of yellowed varnish. In the elaborate composition he pointed to a detail of armored soldiers. We discussed a large vertical painting, rather dingy one may add, of a nobleman in armor. 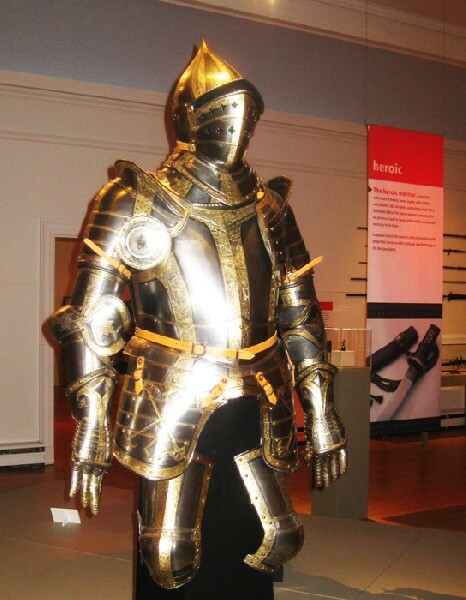 It related to suits of armor on loan from the Higgins. Later, in the rather grand Crane Gallery, he discussed what was originally attributed as an Old Master portrait. It is a reminder of an era when unscrupulous dealers palmed off ersatz masterpieces on the Robber Barons of the Gilded Age, Many of these leading families summered in the Berkshires and works found their way into the museum's collection. As Chase explained such works are much debated by museum directors. Should they be deaccessioned? As period copies they are not worth much. 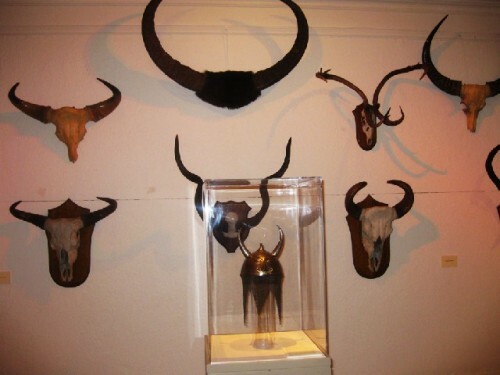 But they are also a part of the history of the museum. They describe the heritage of an era. Like the furniture and bric a brac in the Gardner Museum. Preserving and restoring objects that mostly relate to social history represent an expensive conundrum. Because of Mrs. Gardner's complex will it is a mandate for her museum. But for the Berkshire Museum it is an option weighed against other priorities. While discussing a selection of Polynesian shields, clubs, and spears Chase became animated. He swooned over exotic details of carving. As well as abstracted designs that emulate nature. A club may also be viewed as a bird. 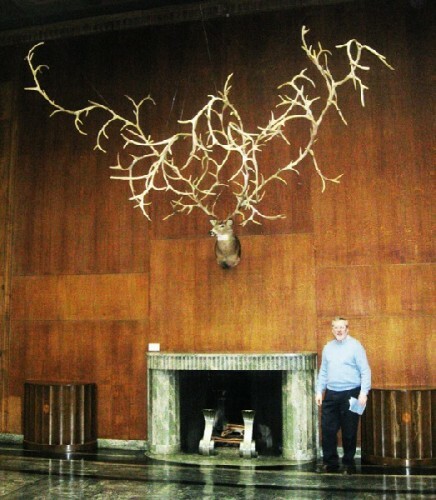 There was a wall of animal horns and antlers. They were displayed as the weapons of nature, designed by the Creator. But then studied and emulated by mankind. This point was made by juxtaposing an elaborately engraved Persian helmet ornamented with a pair of horns. Next to shields from the Fijii Islands were vintage images that illustrated how they were worn and used. The exhibition makes the important point that, while beautiful to look at, the objects on display had a grim intent. It is essential to consider the ceremonial use and function of objects. The African masks that Picasso discovered, which inspired the birth of Cubism in 1907, were originally used in dance and rituals. There is a tendency to consider formal aspects of "primitive" objects without placing them in context. The appearance of an exquisitely crafted weapon tells only a part of the story. A unique aspect of Berkshire Museum projects is the manner in which genres are combined. Hardly noticed in the exhibition is a tiny Etruscan bronze of a warrior. If you look closely there is evidence that other than sword, helmet and shield the warriors fought buck naked. The tiny sculpture is located near a Greek 6th Century B.C. 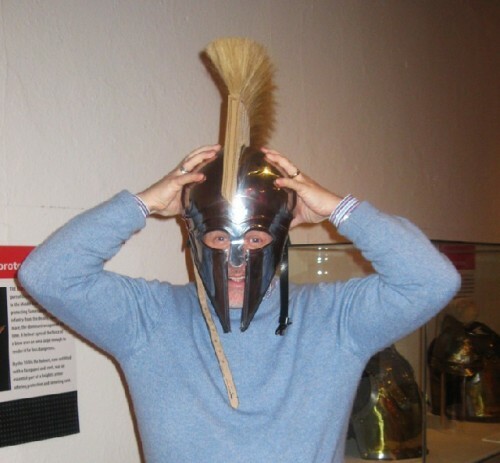 bronze helmet and sword on loan from the Higgins Armory. Chase extolled the technical accomplishment of Ancient Greeks melting metal and casting it into weapons and sculptures. He marveled at techniques that we take for granted. "It's not like they had blast furnaces" he said. "Imagine the technology involved to get metals hot enough to melt." In a section of the exhibition devoted to aspects of camouflage there were large format photos of soldiers by the Berkshire based artist, Jonas Dovydenas. He has been traveling to Afghanistan working on a series of images over several years. An aspect of the sophisticated legerdemain of organizing interactive exhibitions is drawing upon a vast range of resources. Working through a series of galleries, and their related themes, we came to a display of fire arms; from early muskets and flint lock rifles to Colt revolvers. It seems that there was an interesting social connection as members of the Colt family from Hartford married Cranes from the Berkshires. This is how many of the antique fire arms came to the museum's collections. There were several revolutionary era flint locks with a local provenance. "It is always important for us to make that Berkshire connection." It is a mandate for the museum to help us to understand all aspects of the region from history to nature. Whenever possible, during the winter season, Chase likes to hit the slopes. His passion for being in nature is as intense as a love of the fine arts and objects. "Doesn't that explain the Berkshire Museum" he stated as we talked over lunch. Because of the range of his interests Chase is a perfect fit for this very unique museum. "When I am out in nature, hiking or skiing" he said. "I often like to point out details that my friends overlook. I see and am fascinated by the environment. In the museum I love to visit the coral tank in the aquarium. It is just so beautiful." We probed into his interests. One of them is Native American Art. That started in the 1980s when he first organized an exhibition while working for a museum in Texas. He came to know such leading Native artists as Jaune Quick to See Smith and Kay Walking Stick. Later he was director of the Rockwell Museum in Corning, New York which is noted for its Native American collections. From there he came to the Clark before moving on to the Berkshire Museum. 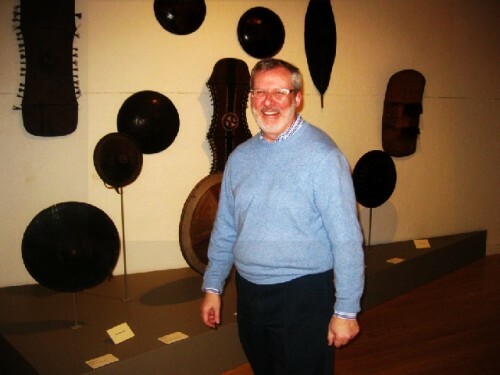 In 2012 he is organizing an exhibition based on some 300 Native American objects in the museum's collection. 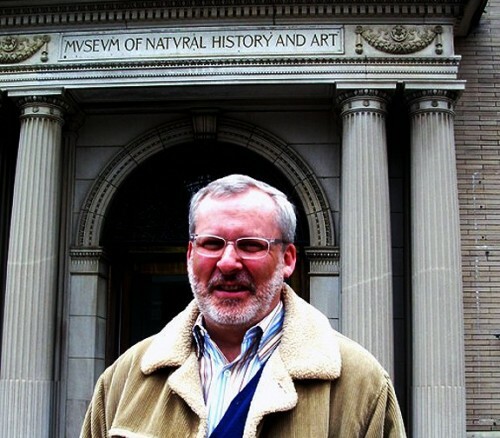 He will work with the curator Kathleen Ash Milby of the Smithsonian Museums. That project will combine historic materials, much of it from the region, as well as contemporary Native American artists. It is too early to say just what artists will be included in the exhibition. It was interesting to discuss exhibition strategies. In the art world pecking order the Berkshire Museum is often snubbed. Why would one consider visiting a museum that displays dinosaur bones, minerals, stuffed animals and fish as well as paintings and sculptures? Good grief. But Chase knows his audience and what turns them on. Most of those who come to the museum are local. Last summer, during the season long monsoon, many of the tourists and their families flocked to the museum's Frog show. It was interesting, for example, that the Mom we chatted with has driven from Connecticut to the Berkshire Museum several times. But, when asked, has never visited Mass MoCA. Perhaps when the kids are older. "If we put up a 2D show of contemporary art nobody comes" he said. "We need to have interactive elements and a variety of objects. Also display, exhibition design, and signage are crucial. The material has to come alive." But Chase is very hip about contemporary art. He has been active in reaching out and including the leading contemporary artists of the region in projects and acquisitions. The museum owns a major photograph by Gregory Crewdson. Chase related seeing the artist recently in the galleries with his kids. "He loves the museum" Chase said. "I asked him about his next project and it seems he has been shooting in an old film studio in Rome." Stephen Hannock, a leading landscape painter, is also a great friend of the museum. The museum owns an important study for a recent Newcastle panorama which was commissioned by Hannock's friend, the musician Sting. In the last room of the current exhibition there as a display of vintage propaganda posters from World War Two. Chase commented that this was just a selection from a large collection of the material. On the other side of the gallery were posters by the controversial artist Shepard Fairey. He was arrested on an outstanding warrant while on his way to the opening of his Institute of Contemporary Art retrospective last fall. Fairey is being sued for copyright violation in his famous Obama campaign poster. The work of Fairey, a graffiti artist with a clothing and skateboard line, is a perfect match for young visitors. Including him in the current exhibition is an example of the clever strategy of expanding the dialogue. It is also why I have evolved as a convert and fan of the Berkshire Museum. We have come to expect the unexpected.